Have a browse and help yourself! Shoppers in Eastleigh have been flocking to a new bookshop with a difference. Everything inside it is free! A ‘Books for Free’ store has opened up inside the empty former bank premises opposite Tesco at the Swan Centre. 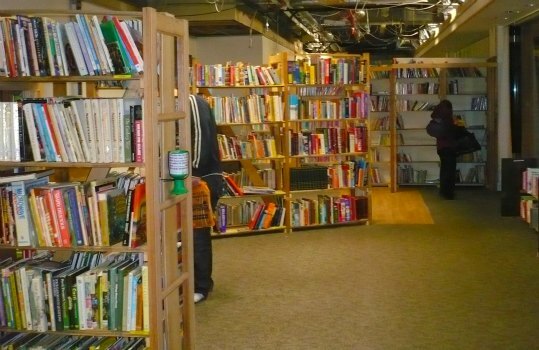 All the donated stock is completely free, the Charity behind the initiative Healthy Planet says that giving away unwanted books prevents them going to landfill. People wandering into the store to browse are baffled to find no checkout – and are surprised to be told to just help themselves. “Barclays who own the shop are happy to let us stay here until they can find someone to lease it to”. Inside the store all the books are arranged by subject and the children and adults fiction section are sorted alphabetically by author. There are paperbacks, hardbacks major reference books and even complete sets of encyclopaedias. For those who feel having books for ‘free’ is too much of a bargain there is a donation tin – donations will go to shop running costs although it is staffed by volunteers. A great concept but I wonder if reducing the value of second hand books to zero will actually exacerbate the problem of books being thrown away. This certainly will impact on th ebusiness of secondhand book sellers from Charity shops to private sellers. There won’t be much point taking books to car boot sales if no one is going to buy them. As for new booksellers – surely this will put pressure on prices and profits? Who wants to pay £20 for new book when you know that as soon as you walk out of the shop door it’s value will be £0.00? NOTHING in life is “free”. There is ALWAYS a price to pay. In this case, I suspect the price could be the eventual destruction of Eastleigh’s proper book shops, including Oxfam. Being a bibliophile I can only hope that this “shop” is forced into oblivion before it sets a trend. Remember the Pound Shop? Then the price went down to 89 pence and I believe 79 pence. This is called the RACE TO THE BOTTOM! We are good at that in this country. We flogged off our most important asset (our manufacturing base) and now we doing the same with our retail base (destroying it by the internet). This suits the big manufacturers, because it means they are progressing towards “monopoly”, which means they can get away with a drastically reduced range of goods. That is disastrous for not only the consumer, but the consumer society. A lack of diversity is ruinous to any society in the long run. Oh boy! I shall NOT be tempted to take these “free” books. I would rather pay a couple of quid and keep someone in a job in Oxfam or Waterstones where the choice is better. However if anyone comes across the full four volume set of Hilpert’s German English, English German dictionaries from 1853, then please take them for me and I will pay you later!